Rodder is a very high quality cable pulling equipment manufactured by us. Used in Telecom Industry having Tensile Strength more than 1MT. 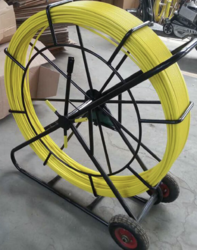 - We Fiberglass FRP Duct Rodder, Fiber Optic Cable Blowing Machine, HDPE Duct Push Fit Coupler, We have complete solution for fiber optic cable installation and maintenance. Duct Rodder is a very high quality cable pulling equipment manufactured by Adishwar Tele Networks in India. Its design make it compact and easy to carry. 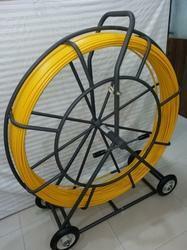 Duct Rodder is fiber glass rod covered with high density engineered plastic. Having high tensile strength.Duct Rodder can cater to large types of cable installations. Line Length: 200 mtr, 250 mtr & 300 mtr.